The Term editor is dedicated to term definition into different languages sharing the same ontology (fig.1). 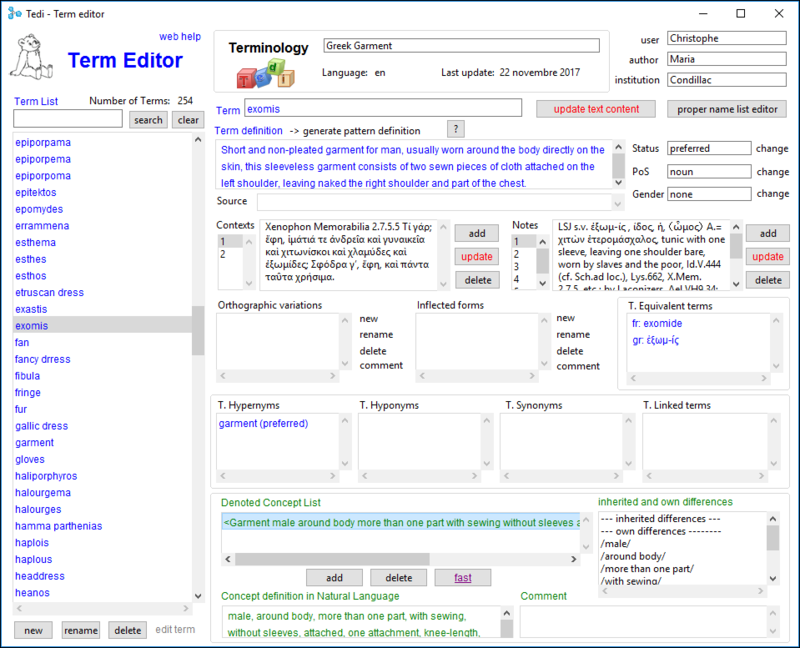 For every language, the Term editor provides a set of features for the definition of the term itself including definition in natural language, contexts and notes, term status and PoS. It allows to specify the denoted concept(s), i.e. the meaning of the term from a terminological point of view. Since the different terminologies share the same ontology, the equivalent terms (in different languages) are automatically identified. Tedi distinguishes the « terminological synonymy » from the « discursive synonymy »: 2 terms are « terminological synonyms » if and only if they denote the same concept. With such a definition, it is possible to automatically find out the terminological synonyms, hypernyms, etc. At last, Tedi also offers a Proper name editor.